News from the Biospec group. These are fully-funded PhDs in the Institute of Integrative Biology (IIB) in the University of Liverpool. The close date for both is Thursday, February 28, 2019. You will join a dynamic research group based in the IIB where the focus is to investigate cellular metabolism. Details of the current projects and diversity of work, as well as more general papers, can be found here. This entry was posted in News on December 12, 2018 by Roy Goodacre. Our work on the detection of adulteration in cococnut water with Raman spectroscopy has recently featured on BBC Radio programme You and Yours. This entry was posted in News on September 26, 2018 by Roy Goodacre. We are delighted to see that our research work with Jon Lloyd and other colleagues in Earth and Environmental Sciences on algal colonization within a nuclear fuel storage pond which was published in mBio in June now features in The University of Manchester's In Abstract: Edition 06. This entry was posted in News on September 7, 2018 by Roy Goodacre. 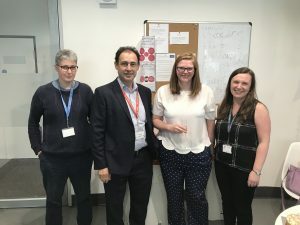 Many congratulations to Dr Claire Pickering for successfully defended her PhD on Thursday 9th August 2018. Claire's PhD is entitled "Development of rapid reagentless, in situ detection of biological threat agents and assessment and correction of the environmental conditioning on the vibrational spectrum". This was a DSTL funded PhD studentship and the primary supervisor was Dr Matt Baker (University of Strathclyde). This entry was posted in News on August 10, 2018 by Roy Goodacre. Richardson, P.I.C., Muhamadali, H., *Ellis, D.I. & *Goodacre, R. (2019) Rapid quantification of the adulteration of fresh coconut water by dilution and sugars using Raman spectroscopy and chemometrics. Food Chemistry 272, 157-164. This entry was posted in News on August 9, 2018 by Roy Goodacre. Dr Neha Dhami (2017) Interference of central metabolism (TCA cycle) to influence CHO cell productivity. UCB. Dr Chloe Westley (2017). 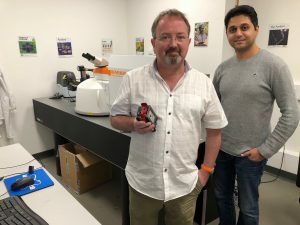 Raman Spectroscopy and its Enhancement Techniques for Direct Monitoring of Biotransformations. BBSRC. Dr Abdu Subaihi (2017) The Development of Enhanced Raman Scattering for the Analysis of Biomedical and Pharmaceutical Compounds in Biofluids. Saudi Arabia Government. Dr Ewa Szula (2017) Metabolic profiling and imaging of CHO cells for fusion protein production. BBSRC. Dr Robert Eendebak (2017) The potential relationships between hormone biomarkers and functional and health outcomes of ageing – a multinational longitudinal cohort study of ageing in men. BBSRC. Dr Heidi Fisk (2017) Raman Spectroscopy for the Direct Monitoring of Microbial Biotransformations. BBSRC CASE with GSK. Dr Mekhala Spencer (2017) The development of Raman spectroscopy for monitoring industrial biopharmaceuticals. BBSRC CASE with Pall. We are very grateful to all funders for these PhD projects. 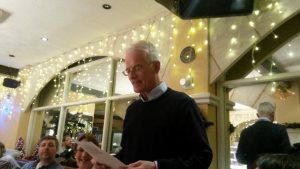 We sincerely wish Dr Mark Barley a very long and wonderful retirement and we wish you lots of joyous time with your family. We also look forward to seeing Mark from time to time in the MIB and hearing more of his travels. Our work where we showed for the first time that UV resonance Raman spectroscopy can be used to monitor enzyme-catalysed reactions as the reaction is occurring: *Westley, C., *Fisk, H., Xu, Y., Hollywood, K.A., Carnell, A.J., Micklefield, J., Turner, N.J. & Goodacre, R. (2017) Real-time monitoring of enzyme-catalysed reactions using deep UV resonance Raman spectroscopy. Chemistry – A European Journal 23, 6983-6987. The first report of spatially offset Raman spectroscopy (SORS) for the detection of counterfeit alcohol through the spirit bottle. This work also picked up some international news articles: Ellis, D.I., Eccles, R., Xu, Y., Griffen, J., Muhamadali, H., Matousek, P., Goodall, I. & Goodacre, R. (2017) Through-container, extremely low concentration detection of multiple chemical markers of counterfeit alcohol using a handheld SORS device. Scientific Reports 7: 12082. We also collaborated with Prof Gary Siuzdak from The Scripps Research Institute on online XCMS for metabolomics: Huan, T., Forsberg, E.M., Rinehart, D., Johnson, C.H., Ivanisevic, J., Benton, H.P., Fang, M., Aisporna, A., Hilmers, B., Poole, F.L., Thorgersen, M.P., Adams, M.W.W., Krantz, G., Fields, M.W., Robbins, P.D., Niedernhofer, L.J., Ideker, T., Majumber, E.L., Wall, J.D., Rattray, N.J.W., Goodacre, R., Lairson, L.L. & Siuzdak, G. (2017) Systems biology guided by XCMS Online metabolomics. Nature Methods 14, 461-426. Westley, C., Xu, Y., Thilaganathan, B., Carnell, A.J., Turner, N.J. & Goodacre, R. (2017) Absolute quantification of uric acid in human urine using surface enhanced Raman scattering with the standard addition method. Analytical Chemistry 89, 2471-2477. Subaihi, A., Trivedi, D.K., Hollywood, K.A., Bluett, M.A., Xu, Y., Muhamadali, H., Ellis, D.I. & Goodacre, R. (2017) Quantitative on-line liquid chromatography-surface-enhanced Raman scattering (LC-SERS) of methotrexate and its major metabolites. Analytical Chemistry 89, 6702-6709. Fisk, H., Xu, Y., Westley, C., Turner, N.J., Micklefield, J. & Goodacre, R. (2017) From multi-step enzyme monitoring to whole-cell biotransformations: development of real-time UVRR spectroscopy. Analytical Chemistry 89, 12527-12532. 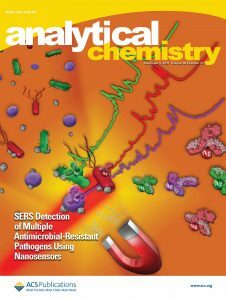 Kearns, H., Goodacre, R., Jamieson, L., Graham, D. & Faulds, K. (2017) SERS detection of multiple anti-microbial resistant pathogens using nanosensors. Analytical Chemistry 89, 22666-2673. Finally, Roy was made a Fellow of the Learned Society of Wales (FLSW) in May and a Fellow of the Royal Society of Chemistry (FRSC) in October. This entry was posted in News on December 17, 2017 by Roy Goodacre.